World folk music, a collection of songs reflecting the musical and cultural spirit of the Balkan Sephardic Jews with contemporary vocal interpretations. Susan Gaeta is a vocalist and guitarist. She performed jazz and both American and Argentine folk music as a soloist in Buenos Aires, Argentina. Under the auspices of a Folklife Apprenticeship Program of the Virginia Foundation for the Humanities, Susan completed studies with National Heritage Fellow, Flory Jagoda, a Bosnian Sephardic composer, singer and musician honored by the National Endowment for the Arts for her contribution to preserving a traditional art form. This apprenticeship included studying and performing with Flory in numerous venues. Susan performs nationally as a soloist, as well as a guest accompanist of Flory Jagoda. She has appeared at the Kennedy Center for the Performing Arts, at the Greater Washington Jewish Folk Arts Festival, the Holocaust Museum and before numerous Jewish and Inter-faith communities. From Her Nona's Drawer, was recorded to preserve and continue the music of her mentor. 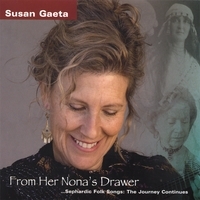 This recording traces the evolution of the authentic a cappella women's Sephardic vocal tradition and Ladino language that Flory learned from her grandmother, to Susan's interpretation of the composer's more contemporary pieces. A wonderful, personal album. For me, it was lovely to be exposed to Ladino songs, a wonderful complement to the rich variety of Yiddish and klezmer songs available elsewhere. First and foremost, this is just a beautiful collection from Susan and her group. They have a clear and strong connection with the tradition and a real artistic hand in birthing a new generation of this music. Wonderful to hear Flory Jagoda's original treatments alongside some of the more contemporary arrangements.